Tate Stevens was crowned the winner of Season Two of the X Factor Thursday night, beating runner-up Carly Rose Sonenclar and third place act Fifth Harmony. He won a $5 million recording contract and a Pepsi-produced debut video that will premiere at the 2013 Grammy Awards on February 10th. Co-hosts Mario Lopez and Khloe Kardashian announced that the 37-year-old country singer from Belton, Missouri – a member of mentor L.A. Reid's Over 25s team – nabbed the majority of the 35 million votes cast after Wednesday night's final performance episode. "First and foremost, I gotta thank the man upstairs for taking care of me, my family and all the country music fans," Stevens said with tears in his eyes upon hearing the news. "Thank you so very much for all the votes. This is the best day of my life." Mentor Reid then congratulated him by saying, "You deserve this. I'm proud to have worked with you and I think you represent The X Factor really, really well." 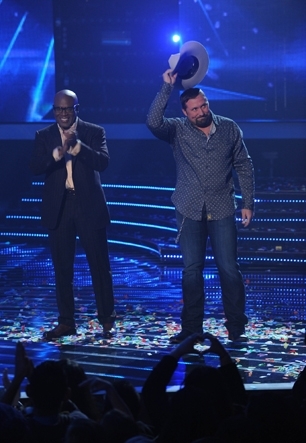 Stevens then took the stage one last time to perform Chris Young's "Tomorrow," which was the "$5 million song" he sang Wednesday night, confetti and streamers raining down while the rest of the Season Two contestants joined him onstage. Stevens was the front-runner during the bulk of the live shows, topping the leaderboard three times to Sonenclar's two. Before the winner was announced, Stevens and Sonenclar took the stage together to perform a duet of Miley Cyrus' "The Climb." The X Factor finale also featured performances by X Factor U.K. alums One Direction, who sang their new single "Kiss You," and rapper Pitbull, who did "Don't Stop the Party."